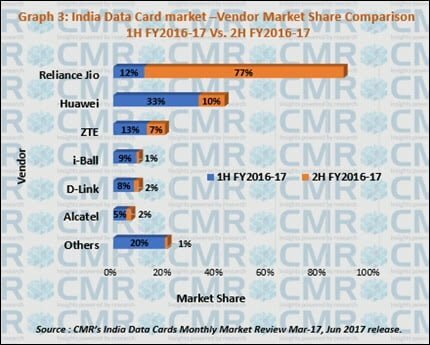 Reliance Jio has replaced Huawei as the most favoured vendor in the data cards segment in the second half of the fiscal year 2016-17, in terms of market share. According to a CMR report, the market share of Reliance Jio grew from 12 percent in first half of the fiscal year 2016-2017 to 77 percent in second half of the fiscal year 2016-2017 due to free data services along with the comparatively lower price of its Mi-Fi Data Cards. 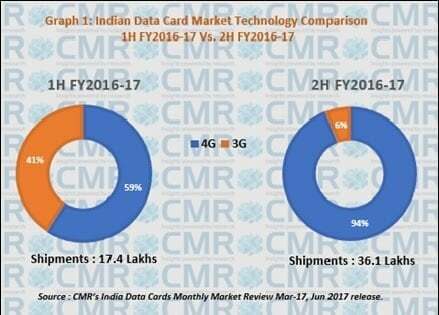 Overall, the Indian Data Cards market registered a growth rate of 107 percent in 2H FY2016-2017 (second half of the fiscal year 2017-17) to 3.6 million over 1H FY2016-2017, in terms of units shipped, according to CMR’s India Data Cards Monthly Market Review March-17 report released earlier today. The report states that the overall LTE/4G Data Card shipments witnessed 228 percent subsequent rise to 3.3 million in 2H FY2016-2017. LTE/4G replaced 3G as the most favoured technology in the Data Cards market. That said, 3G Data Card shipments declined sequentially by 67 percent in 2H FY2016-2017, when compared to the first half of FY2016-2017. “Mi-Fi devices led the growth of LTE/4G technology in 2H FY2016-2017. 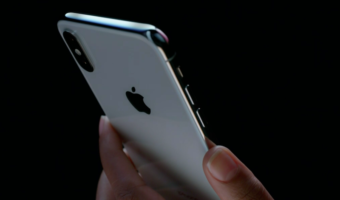 LTE based Mi-Fi devices jumped sequentially by 333% in 2H FY2016-2017,” stated Shipra Sinha, Lead Analyst, Industry Intelligence and Channels Research Practices, CyberMedia Research. Huawei shipments plunged sequentially by 36 percent in 2H FY2016-2017. The vendor’s market share decreased from 33 percent in 1H FY2016-2017 to 10 percent in 2H FY2016-2017. Also, ZTE shipments witnessed 6 percent sequential growth in 2H FY2016-2017, while other vendors like Alcatel, D-Link saw fall in 2H FY2016-2017. Reliance Jio’s JioFi 3 was the fastest moving model followed by JioFi 2 on number two position. Huawei’s E3372H-607 was in the third spot. Data Cards with a data rate of 150 Mbps contributed around 92 percent to overall shipments in 2H FY2016-2017. “Mi-Fi devices are expected to show a further rise in the future. 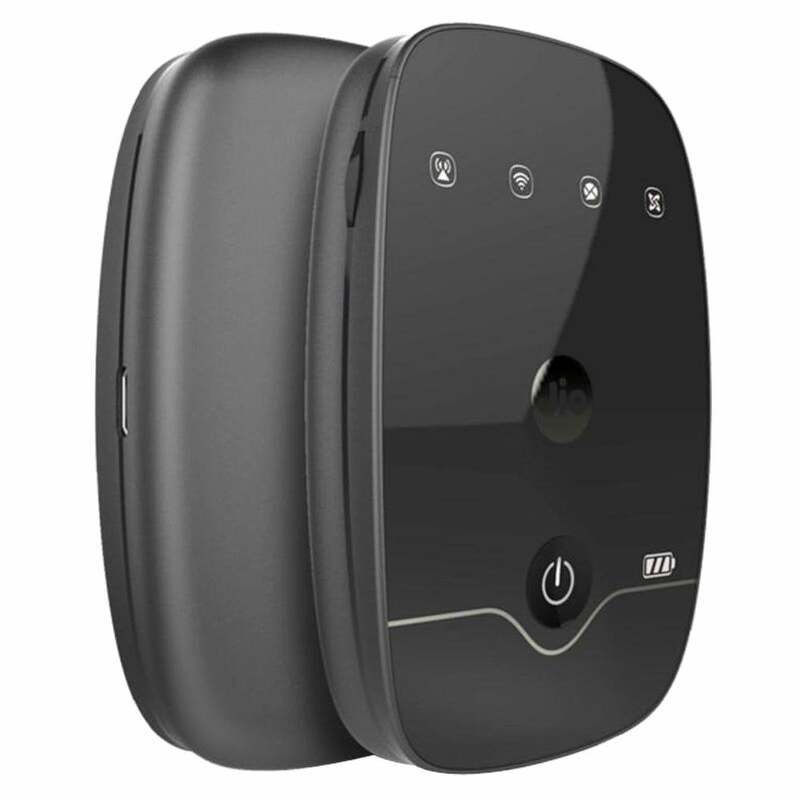 Inbuilt battery with anywhere, anytime data connectivity because of the various affordable data plans in Mi-Fi devices are the key features contributing to its growth. 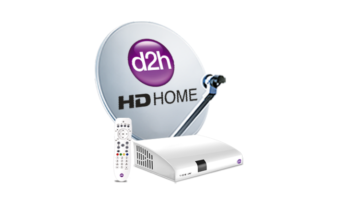 A large number of user support with a single device is also one of the reasons for the growth in Mi-Fi devices. 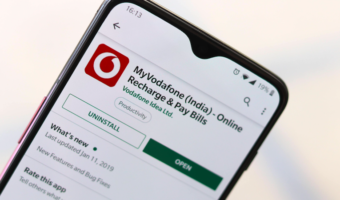 The significant push by telecom service providers is also making and continue to make Mi-Fi cards the most favoured option in India,” Shipra concluded. Its ZTE. Not sure what T T is saying.